State Police have released their report on the death of Aaron Hernandez by suicide last month in a Massachusetts prison. The report confirms the ruling that the cause of death was asphyxia by hanging, ruled a suicide by the medical examiner. A toxicology report came back negative for all substances. The report goes into detail about how correction officers found Hernandez, what they found in his cell, and the immediate response. It says a corrections officer first noticed a bed sheet hanging from Hernandez’s cell door. The officer told Hernandez to remove the sheet, then poked at the sheet himself. That’s when the sheet fell and the officer saw that Hernandez had hanged himself from the window, according to the report. When officers tried to enter, cardboard had been shoved in the door tracks, making it harder to open, per the report, and the floor was slippery from all the shampoo spilled on it. 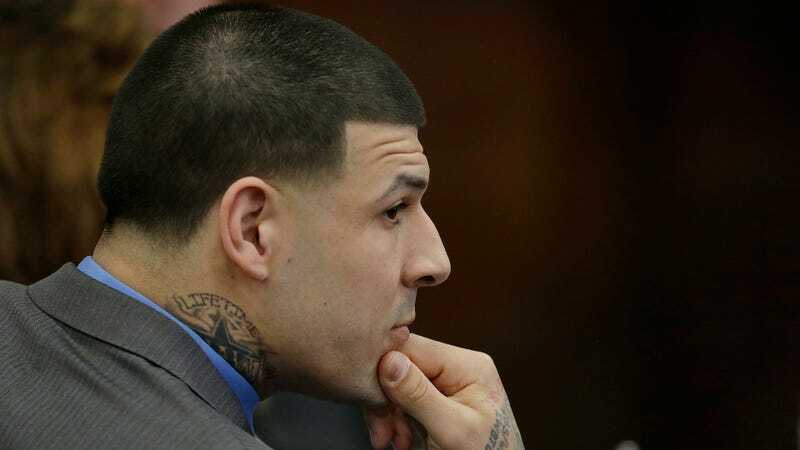 When officers got inside, they found that Hernandez had a “large circular blood mark” on each of his feet and “John 3:16” written on his forehead in ink, according to the report. “John 3:16” and several other drawings, which are not described in the report, were also written on the wall of his cell “in a substance consistent with blood,” and a Bible was open to the verse and marked with blood, the report said. Three handwritten notes were left by the Bible, but the report redacts several lines of information that relate to them. Earlier this year, the Boston Globe reported on how Massachusetts prisons have the fourth-highest rate of prison suicides in the country, with a rate of 32 suicides per 100,000 state and federal prisoners.. The former New England Patriots tight end had been sentenced to life without the possibility of parole for the murder of Odin Lloyd. Just before his death, Hernandez was found not guilty of a separate double homicide in Boston.